Create an exciting baseball league and World Series. Daniel A. Silvestri has been working with computers for three years now, and is employed by a major publisher of business software for MS-DOS machines. His interests in computers lie in business applications, financial planning, adventure gaming and strategic battle simulations. The bases are loaded. One out, bottom of the ninth. The game is tied. You need this win to put your team in the play-offs. Here's the stretch, the pitch, the swing. It's a deep fly ball to center field. Back, back, pulled in on the warning track! Here comes the runner, racing from third to tag up. Here's the throw, then a headfirst dive. He's...SAFE! You win and advance your team to the play-offs and a chance at the World Series! The season for the Great American Pastime is almost upon us. So let's get in some practice before opening day. We'll put together a package that will let you design a baseball team you can manage, providing full details for running a computer baseball league and drafting players, creating World Series rules, tracking ERAs (Earned Run Averages) and more. As in real baseball, organization is important, and some money will have to change hands before the first ball of the season is thrown. This means purchasing some software. The purpose of the league we're about to form is to create a schedule of computer baseball games to culminate in a World Series competition. To form the league, you'll need managers. So organizing personnel is the first task at hand. Each manager you recruit will represent one team in the league, and will lead that team to either the World Series Championship, or a less lofty ranking. So go out and sign up some managers who want to enter a team in your league. A baseball package for great fun. To begin, you'll need to purchase MicroLeague Baseball. You can find it at most good software stores, or you can call 1-800-Playbal to order directly from the publisher. You can also buy it from mail-order houses. Its retail price is $39.95 for MLB-I and $59.95 for MLB-II. If you like the thought of managing a baseball team, this game is worth every penny. The disk comes with full rosters of over twenty-five of the all-time great teams. This game is not a hand-eye coordination game, but rather a strategy game that lets you manage a team. That means choosing a starting pitcher, a lineup, batting order, sending a pitcher to the showers, selecting a pinch-hitter or runner, and so on. You can call for a bunt, steal, aggressive or safe base running, or virtually anything else a manager does in a game. In fact, the new ST version, MLB-II, takes into account "stadium dimensions, injuries, arguments with the ump, rain delays and other acts of God," according to the publisher, MicroLeague Sports Association. This version also contains a box score and statistics compiler so you can track your team's performance game by game. You can even use the real statistics of actual play, or update the starting stats on an ongoing basis. This adds multifaceted dimension to the game, as you can now track a batter's actual performance against a certain pitcher automatically. You'll also want to buy the General Manager/Owners disk, which gives you the power to trade players, construct a team to include Babe Ruth and Bill Buckner, and even "create" players not on the original game disk. (I'll tell you more about this later.) The addition of this disk to your league will add a tremendous amount of flexibility and excitement to the game. Both the game disk and the General Manager/Owners disk should be available by the time you read this. If you go with the MLB-I game (which doesn't include the box score and stats compiler), and you already own a spreadsheet program, you have the option of tracking your pitcher's Earned Run Average against certain opponents. In our Chicago League, we listed our starting and relief pitchers in the left column under "Names," then created three additional column headings for "Innings Pitched," "Earned Runs Allowed" (or runs this pitcher gave up) and one for the ERA. The formula you need for the ERA column is: Earned Runs Allowed, divided by Innings Pitched, times 9. This will compute ERAs, and give you a clear picture of who's doing the best job. The lower the ERA the better, of course. If you want to get fancy, you can track each pitcher against each opponent, to really know who should pitch against who. Just jot down the number of innings your pitcher played, and the runs he allowed to score for input after the game. For additional fun, if you own a graphics program such as Print Master, you can create posters and banners announcing big games (like the first game of the World Series), to add atmosphere to your "ballpark," and enhance the mood and excitement of the games. You can even create letterhead for the appointed "Commissioner of MicroLeague Baseball" to use when settling any rule discrepancies, or create a calendar for each team with their schedules. Hurry, the Rules Committee is about to meet! The above items will start you on the right track, while the following section will save you valuable hours in creating the rules and providing a setup to ensure fair play. Then get ready to put your management savvy to the test. Because players have different skill levels, you want to create teams that will be balanced and of equal caliber. Therefore, it's necessary to create player guidelines to assure uniformity. "A" caliber players will be those players who appear on either an All-Star Team or an American or National League Greats Team. This is true whether they're pitchers or fielders. These teams are on the game disk. "C" caliber players are defined as any player with a batting average of .240 or below and 15 or fewer home runs. A "C" pitcher is defined as a pitcher (whether starter or relief) with a losing record or an ERA of 4.50 or higher. "B" caliber players are all players (pitchers or fielders) who don't meet the criteria for either "A" or "C" players. 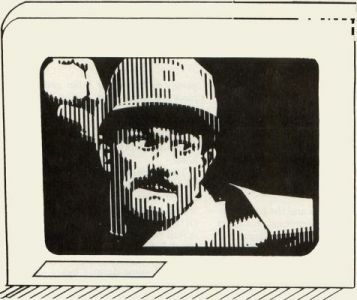 If you manually input player statistics from The Baseball Encyclopedia, for example, then any player who has appeared on an All-Star Team is classified as A. The same B and C rules apply. Each team that you or your fellow managers create can have five A players, fifteen B players and five C players. A full roster is fifteen fielders and ten pitchers, and the program will require this. As manager, you can acquire any combination of A, B or C fielders or pitchers. One manager may elect to have ten C pitchers and load up the bench with hitters, for instance. Rule 1: This balance of A, B and C players must always be maintained on your playing team. Yes, there will be a draft. So your managerial skills will be put to the test before you even see a bat or baseball diamond. You must decide on the best strategy: will you go for the A pitchers, or A hitters? For balanced players or those who can smack the most home runs? For lefties or righties? Your roster of twenty-five players will consist of ten pitchers and fifteen fielders. The draft will be divided into twenty-five selection rounds, and in each round each manager will select one player for his or her team. Depending on the number of managers and teams in the league, you, the manager, should prepare a draft selection sheet, taking into account that you may not always be able to select your first choice. You should have several backups for each position and each class of player. So, if a competitive manager selects your first round draft choice for shortstop, you'll be ready to select another player without bogging down the system. The manager must announce four things when choosing a player: (1) the player's name; (2) the team and year; and (3) his playing position and class (A, B or C). So a selection might go like this: "I take Johnny Bench, from the 1975 Reds. He's a catcher and an A class player." All managers should keep track of who's been drafted. Each manager selects in rotation (you can draw numbers for this) in each round. After the dust clears and the noise subsides from the drafting process, managers can strike deals with other managers. For example, Manager One might know that Manager Two wanted Ted Williams, who Manager One has drafted. Williams, an A player, might be traded for Willie Mays, another A player. All kinds of deals can be struck to recreate the excitement in putting together a team of your own. Rule 3: You must maintain the balance of five As, fifteen Bs and five Cs for your final team and three of each class on your reserve roster. By having the General Manager/Owners disk, you can also have a reserve team, or farm club. As stated above, the reserve team is limited to nine players (fielders or pitchers): three As, three Bs and three Cs. Reserve team players are confined to a total of four trips up to the regular team or back down to the reserves. The manager must always exchange a like-caliber player for a like-caliber player (an A for an A, etc.). After the fourth trip up to the regular team or down to the reserves, the player becomes a free agent, and any other manager can pick him up for free. To maintain the spirit and flavor of the game—and increase a manager's responsibilities—a starting pitcher must be off at least two consecutive games. Likewise, if for some reason a starter is used as a relief pitcher, he cannot make an appearance as a starter in the next two games. A pitcher who doesn't have at least one complete game to his record can't start. (Stats are plainly visible on-screen). Rule 4: Pitching rotation must be maintained, so selecting your rotation is very important. Plan ahead! Set up your game schedule by making a list that includes columns for the teams playing (home and away), which pitchers started and the final score. This should be made available to all managers, so they can review their team's performance, anticipate opponent's pitchers, and so on. You should alternate home and away games so that every other game a team plays is a home game. A schedule of about thirty games is ideal. When the season's over, and the diamond dust has cleared, play-off times are here! The play-off rules will vary depending on how many teams are entered in the league. You should have at least three teams, but can have as many as you want. Of course, the more teams, the more time it will take to complete the season. One good Saturday session, however, could see a fair number of games come and go—and some dreams too. If you have only three or four teams in the league, then the top two teams play in the World Series. If there's a two-way tie for second place, a three-game playoff series is needed to see which of those two teams will advance to the World Series. First place automatically qualifies. If you have more than four teams, the top four teams must have a play-off. The first place team plays the third place team in a three-game series, while the second place team plays the fourth place team. The play-off winners then advance to the World Series. The teams with the most runs during the regular season have home field advantage in the first and third games. Remember: pitcher rotation counts all the way through the World Series, so plan accordingly. The Micro World Series Champion will win the best of seven games. The home field advantage goes to the team with the most runs during the regular season—not counting play-off games. Home field advantage will be enjoyed the first, third, fifth and seventh games—if the Series goes that far. A special series rule: no more rotations can take place from reserve team to regular team, or vice versa, after the play-offs. Therefore, whatever roster you have during the last game of the play-offs—or the last game of the regular season if your team isn't in the play-off games—is the team you bring into the Series. Any players who've become free agents can't be picked up after play-off games. As a manager, you'll be very busy throughout the game. Remember, the statistics for each player are very important. They outline his batting average, number of hits, doubles, triples, home runs, strike outs, bases on balls, stolen bases and more. Each player is also rated for general fielding ability, so knowing your top defensive players can help you late in a game, because these guys—just like their real-life counterparts—make errors too! You may want to do some substituting. Selecting pinch-hitters, pinch-runners, and knowing when to pull your pitcher, are all important issues. If you can, practice against the computer and remember who's doing the hitting. To be fair, let other managers practice too. A conservative game plan usually works best, but then again, you may want to throw your opponents off by stealing bases a lot or using the hit-and-run. Be creative, and always think. One last tip: each player has a listed batting average, but the number of hits, plus the number of bases on balls (walks) he received, divided by his At-Bats will give you the statistical average for that player, or how often he gets on base (no matter how). Know your players. Well, if you have any desire to be a baseball manager, this forum is about as good as it gets. And your heart will literally pound with excitement! The software is superb in recreating a true feel for managing the game, and the rules outlined above will provide a quick and headache-free environment for getting your league teams on the playing field as soon as the Commissioner yells, "Play ball!"